Nep Nep's VR romp is westward bound! God bless Idea Factory for localising all kinds of stuff that is just so niche out west. The publisher's latest announcement is that it is bringing Megadimension Neptunia VIIR to our shores. This is a completely rebuilt version of the original Megadimension Neptunia, using an all-new engine, and with added VR support. Related reading: You can read Matt's review of the original Megadimension Neptunia here. So if you've ever wanted to be in Nep Nep's bedroom... well this is the closest you'll get. And if that doesn't sell you on the game, then nothing will. Megadimension Neptunia was already a great game, but the enhanced engine promises to make for a far smoother game, and the VR addition will be a really fun novelty. You don't have to have VR to enjoy this game, but then again, if you like Japanese games and don't yet have PlayStation VR... what are you waiting for? Make this game your excuse to finally buy in when it launches in (America) Spring, 2018. We now know that Animal Crossing on iPhone really is a thing that will be released, and we know what shape that will take. Basically, it looks and feels like all those other Animal Crossing games, only this one will be trading on the fact that lots of people love those other Animal Crossing games to make so, so much money out of them. 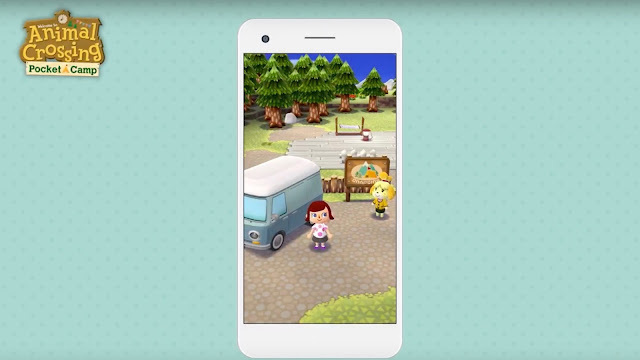 We know the game is releasing in late November, that it's called Animal Crossing: Pocket Camp, and that it will be a free-to-play game. Of course we also know that means all kinds of microtransactions, and in this game it means "premium tickets" which can be used for special items and to speed up the in-game timers. I will never understand why free-to-play game developers actually punish people for playing the game longer, but then I guess people are happy to fork over real cash to deal with these timers when that happens. You'll be decorating an RV, rather than a house, this time around, and you'll be able to visit other people's campsites from around the world and admire the ones that have the best stuff. Which will make you want to buy more of those premium tickets and... oh God are parents going to hate this game. Both for the money their kids are going to spend on it... and the money they're going to spend themselves. Speed running Aussie platformer is Switch-bound! Rogue Singularity is a 3D platformer designed to get people speed-running, and promises to be a return to the glory days of the genre, back on the Nintendo 64 or PlayStation 1. And now the game's headed to the Nintendo Switch as well courtesy of indie publisher, Nnooo, which seems to be the trend for every indie game at the moment. The game offers endless replay value thanks to its procedurally-generated levels, and offers a cool electronic soundtrack composed by chiptune specialist, Derris Kharlan. The game is available in Early Access form on PC now, but will release on the Nintendo Switch in the first half of 2018, along with the other major consoles. The more games the merrier, of course. With leaderboards and that speedrunning focus, I can easily see this game develop itself a dedicated and focused niche audience, even given the other 3D platformers that are making their way to the console (not least of which being Mario Odyssey, of course). Lost Sphear, brought to us by the good people who gave us I Am Setsuna, is looking better and better the more we see of it. This new trailer is just breathtaking. Related reading: Catch Matt's review of I Am Setsuna here. The game follows the story of a group of heroes helping a self-taught swordsman on a quest to save the world. If that sounds like a lot of JRPGs from yesteryear, that's because that's explicitly what it is; this game wants to be a glorious throwback to a grand old era of JRPGs, but with the lovely presentational value of modern games. It worked with I Am Setsuna, and we are certain that it's going to work here as well. The game releases in January in the west... we can't think of a better way to kick off 2018's attempt to challenge 2017 as the best year for games ever.